It's about time for America to wake up and realized that climate change is affecting real people now. And, that climate change = more poverty, more hunger, higher food prices, & more war unless something is done. Now. The weather affects whether or not they have a job and income at best, and at worst, enough food and water for their family to live on. It's not like here in the United States where, for the average middle class person reading this blog posting, climate change may mean nothing more than higher energy and food prices...sometime later...in the future. An abstraction. Inconveniences. Right now, the most compelling image I see about climate change in the United States is an endangered polar bear. This is may galvinize the environmentally aware to take action, but it's not motivating enough for many people in the United States struggling to make it through the current recession. They need to see a human face. They need to feel empathy. In the primarily agrarian developing countries, climate change is not "An Inconvenient Truth" but a life or death issue. *** It is hurting people and wildlife now. It is creating more political insecurity globally now. I think climate change is a human rights story and a security issue and that is the story that needs to be told if the public is to be galvanized to action. There should be more publicity on the probable outcomes of the Climate Change Talks text negotiations. How does a certain amendment change affect people materially? What will happen to a typical Ethiopian farming family if the drought due to global warming continue? How many more families will suffer the same fate in East Africa? How does that affect our national security and resource interests in Ethiopia, Somalia, or Sudan where there are more and more anti-American terrorist groups attracting impoverished youths? Real lives are at stake. Action on climate change will require some altruistic action on the part of all nations as energy sources are switched to renewable and non-fossil fuel burning sources. To get altruistic action, environmentalists and policy makers will have to elicit empathy out of voters and stakeholders. The best way to do this is to translate climate change into material impacts that are affecting real people, right now. I just read a griping story about resurgence of the Taliban in Afghanistan in last Sunday's New York Times article "Held by the Taliban: 7 months, 10 days in captivity" by a journalist David Rohde. By living with the Taliban, as an unwilling prisoner, for nearly a year Rohde brought a human face to this conflict. A few of the terrorists are truly fundamentalist zealots and can't be reasoned with--but those are the minority. It seems from his reports that most join the Taliban for better life, to pull themselves and their families out of poverty and out of fear of reprisal if they don't join. It really comes down to poverty as the main driver of the growth of the Taliban's political control in Pakistan and Afghanistan. What is poverty? 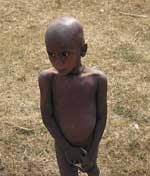 Lack of adequate food and resources for a healthy life. Global warming is causing more poverty and ultimately, will be creating terrorist recruits. 2009 "When the Rains Fail," The Economist Magazine, September 12th, p.27.